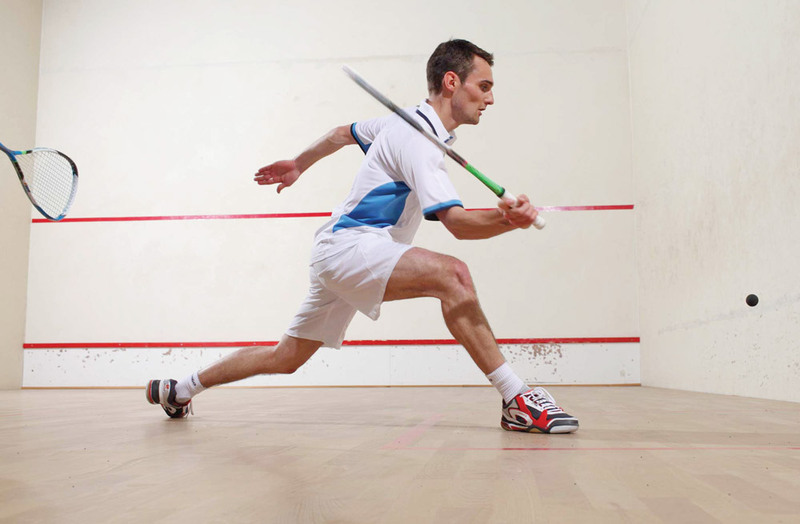 Racquet sport players burn a substantial amount of calories on the court.The game requires constant movement forwards and backwards, side-to-side, running, jumping and lunging. With all this pounding that the feet, ankles and the Achilles and other tendons around the ankle endure, racquet sports can cause a number of foot-related problems for players. One of the most frequently encountered court injuries is the common ankle sprain. Other court injuries are more shock-related, such as stress fractures in the foot or tibia. Stress fractures can be hard to detect and often people will continue to play and delay the correct diagnosis. If the stress fracture is in the metatarsal bone – the most frequent site – there can be swelling in the forefoot. Stress fractures can occur in any of the 28 bones of the foot. A common injury site is the heel. Heel pain can indicate a plantar fascia injury or bone spur. The plantar fascia is a thin, very strong tissue band that supports the arch of the foot, stretching from the heel to the ball of the foot. As the arch falls, the band of tissue is under increasing tension and the weakest link is where the tissue attaches to the bottom of the heel. Over time and with repeated shock, micro events can occur and cause the fascia to tear from the heel. Other injuries occurring in racquet sports may occur in the foot and lower legs as a result of high arches, flat feet, hammer toes, differences in leg length and muscle tightness. Wearing the correct equipment can reduce lower leg and foot stress. Shoes designed for racquet sports should provide stability for side-to-side movement. They are generally heavier and stiffer than running shoes. Select tennis shoes based on comfort and stability for your foot and ankles. Select sport socks that are designed for racquet sports, they provide additional padding where it is needed. Musculoskeletal Podiatrist Jonathan Stanley fits Alex for some corrective insoles. Tennis hopeful Alex Johnson was attending for regular post-operative physiotherapy sessions with Liz Blizzard and she recommended Alex to see Jonathan at the Ilkley clinic. The promising ace’s progress has been hampered by injury since becoming a full-time professional player two years ago. 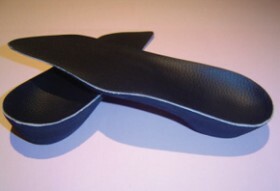 Special insoles were created to correct the position of Alex’s foot which was causing his knee to twist Jonathan devised a numerical prescription which was sent, along with plaster of Paris cast impressions he took of Alex’s foot, to a laboratory where the special insoles, known as orthotics, were created. Alex suffered his first serious knee injury two years ago while playing tennis in Barcelona. A scan revealed that he had torn his meniscus. Alex had two operations to help rectify the problem and is now wearing the special insoles to stabilise his knee. “With sports people, orthotics can help correct your gait. The ones I have get me to change the position of the way I push down when I walk. It takes the pressure off the outside of the knee,” explains Alex. “Using the orthotics has made a huge difference to me. Maintaining match fitness is a constant challenge for an aspiring athlete and it is frustrating to be off court, so having help from professionals who can quickly diagnose and find solutions that work is extremely important to me.” Alex has already played on the first rung of the international circuit in Texas and Mexico and is considering playing for an American College team. Always warm up, a gentle stretching of the lower extremities and the Achilles tendon will help prevent injuries. Lean against a table or wall, placing one foot behind the other. Always roll the weight to the outside border of the foot and don’t stretch to the point of producing pain. Buy new, high-quality athletic shoes and replace them frequently. Have the proper footgear for the sport; running shoes are not suitable for sports such as tennis due to their lack of lateral support. For children, be aware of the potential for injuries of the growth plate in the heel. Persistent heel pain is more than simple overuse, kids should stop participation immediately and a diagnosis should be sought.